Contact one of our friendly property experts for a market appraisal and learn more about current market conditions, what your property is worth and suggested improvements to maximise your selling price. This is the first step to happier days and we suggest getting in contact with us sooner to ensure the rest of the process is not rushed. We understand that the stress of selling a home can be very overwhelming, we also understand that the average Australian lacks the time to prepare their home for sale. Thankfully, The Realest Estate has the connections you may need to prepare your home for sale and can organise it. Whether it may be a gardener, painter or interior decorator, leave it to us to arrange and ensure the preparation process is just as smooth as the selling process. The first 30 days of your marketing campaign are crucial to a successful sale. We believe in the first month of advertising your property should be exposed to as many buyers as possible and highlighting the best features to really give your property the result it deserves. It is important to have your property ready before hitting the market as the first lot of buyers that see your home usually include the purchaser and we don’t the potential purchaser of your home second guessing the purchase. Contact us to see how we can help with getting your home ready for sale sooner. All of our marketing campaigns include dusk photography, this truly does give the ‘wow’ factor and has your property pop out next to all the others when advertised. We encourage you to de-clutter as much as possible and hide all personal items and photographs as they can take away from your property. Clean and tidy spaces work best to highlight your property’s features. We commence with advertising after we have received your approval to go live. 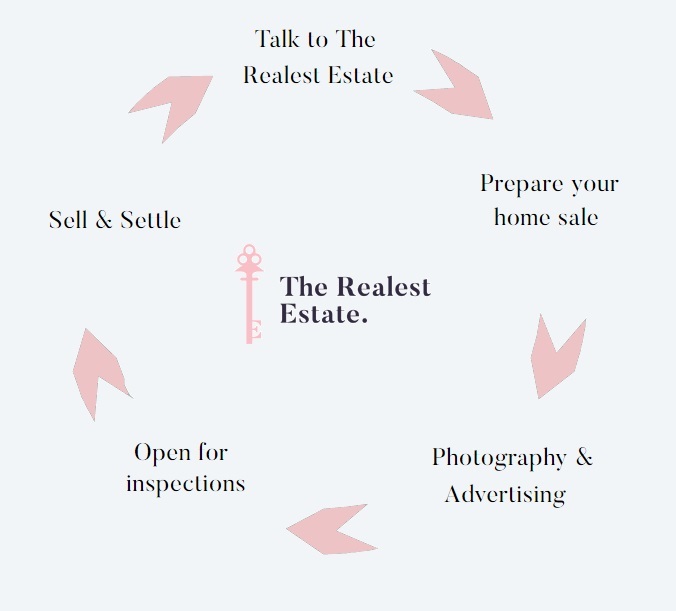 You property will have the best exposure on real estate websites and social media including therealestestate.com.au. This is a very exciting time for you as we receive enquiries and interest from buyers wanting to inspect and gain more information about your home. Open for inspections are set times of 30 minutes where buyers come through to view your home. We set Open for Inspection 4 weeks in advance to give you enough time to organise your schedule accordingly. After each open for inspection your will receive informative feedback from your property expert. Two weeks into your campaign we will set a meeting to give you more feedback in greater detail. Congratulations! Very soon you will be packing your things and getting ready for the big move. This short period may feel like you are in limbo but we emphasise that if there is anything you need assistance with or any questions you may have for your purchaser, feel free to get in contact with your property expert.